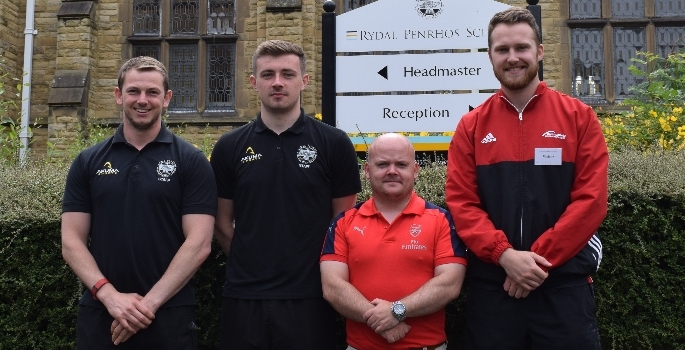 Sports staff at Rydal Penrhos were given a helping hand in their preparation for next year with the help of a Premier League academy coach. Padraig Roche, who works as a Strength and Conditioning coach at the Arsenal FC Academy, visited the school on Wednesday, 14th June to aid staff members from both the Prep and Senior sites with their Athletic Development strategy. Sport scientist Padraig joined Arsenal in July 2013, having already forged a successful career in rugby union. After playing football for Cahir Park AFC and Tipperary, Padraig retrained as a coach and earned a BA in sports management as well as becoming a UKSCA accredited Strength and Conditioning coach, a Level 2 weightlifting coach and an IRB Level 2 conditioning coach. Having obtained his qualifications, the NCSA certified coach undertook a year-long position as head of strength and conditioning at University College Cork in 2007 before moving to Munster’s Academy. After that, Padraig worked with the Irish national rugby union team as their first-team assistant strength and conditioning coach and had a similar role with their under-20 squad before switching back to football when he joined the Gunners. Director of Sport, Allen Boyd, said: “Padraig has a wealth of experience at the elite level of sport in both football and rugby, and it was great to welcome him here to aid with our plans for the next academic year.